After *yet another* disk crash, my TMG service wouldn’t start. Databases were all fine and no disk errors to be found. I was just about to repair\reinstall when I noticed the following blog post which sorted the problem out much more easily! It pays to be paranoid in the security world. If you use Windows Server Backup then chances are you have the scheduled task that starts the backup still using the default settings that was created. For the most part this is fine. However, recent experiences have led me to make one small change. If you have a server crash for whatever reason, the default setting for the backup task is to run the backup if the previous event was missed. This means that if the crash happened before teh backup time, then when you bring the server back up it will attempt to start the backup right away. This can be a real pain as you may be in the process of trying to get services running again and the disk (and system) will run painfully slow while the backup tries to run. You also probably don’t really want a backup done just yet until you know you have a system in a good state that you actually want backed up. All depends on your circumstances. Go figure. When you install the IIS management feature in Win8, the *only* thing you can manage is a local install of IIS. It doesn’t give the option to connect to another server at all. Thinking I’d stuffed it up somehow (using the mouse with my left hand instead of right perhaps?) I removed and re-added it, but still the same. No remote connect option! This is really, really annoying. Everytime Java prompts to update, it also very kindly gives you the option to not install the ASK toolbar. This is because it very kindly selects the install ASK toolbar automatically and you have to opt-out. If you don’t pay attention (looking at you Dave), or it’s a family/friend who doesn’t notice these things, then the ASK toolbar takes over your browsers search settings and steals screen real-estate by appearing at the top of your browser. Luckily it turns out there is an easy way to stop it asking for future updates. I’ve started to get a *lot* of warnings being logged lately with EventID 10010, 1035, 6027 and 6002. The specific cause I don’t know yet, but they have only appeared recently after I have been “fixing” my server after some serious disk issues. It’s hard to say though because there have been so many that my event logs have been clearing out the older entries so I need to increase their size to capture them all. While the server appears to be running fine, these warnings are appearing repeatedly now. I don’t know if they are because of further issues since the crashes, or have started because of the way I fixed something else. I know I’m not the only one, a lot of other people have posted with the same messages, so perhaps it’s specific to Server 2012, or a recent OS update that has been applied. UPDATE: I’ve seen some reports that this has been fixed in CU1. I haven’t installed it yet, so can’t confirm at this time. 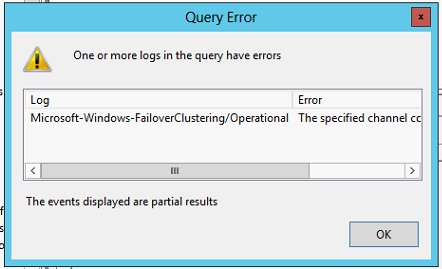 When you open Event Viewer to look at the “Microsoft Exchange with Database Availability Group Events” Custom view you will get a query error for “Microsoft-Windows-FailoverClustering” if you have an Exchange install that doesn’t have any Database Availability Groups (DAGs) installed. This would be typical of a small single server install. While not critical, it is annoying. In my never ending quest to learn a new thing everyday, I decided I needed to spend more time with Powershell. After a recent Hyper-V issue it seems it would be just the thing to help. So imagine my surprise when nothing I did could get the Hyper-V PS commands to work! It turns out that because my server had been upgraded to Server 2012 from 2008R2, when the Hyper-V role is installed, the Hyper-V PS module isn’t.